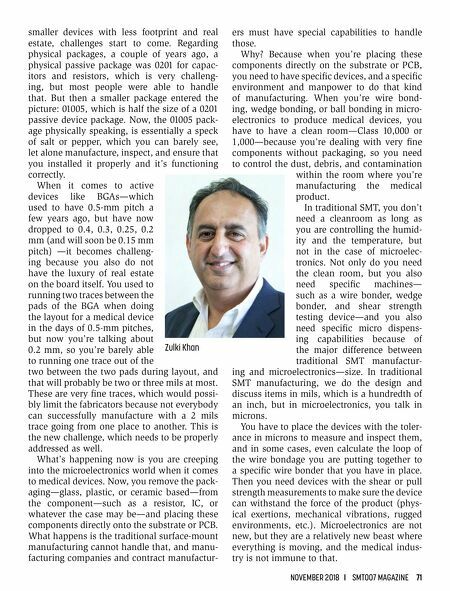 70 SMT007 MAGAZINE I NOVEMBER 2018 you need for making the medical devices, in addition to ISO 9001:2015, which is the latest ISO standard for general manufacturing. We either do the full turn-key or the consign- ments or layouts for medical devices. Some of the medical device customers we've worked include Boston Scientific, Medtronic, Abbott Point of Care, Abbott Labs, Covidien—which is now part of Medtronic—and a bunch of other companies. We have a variety of experience. We don't claim to know everything, but we learn along the way. 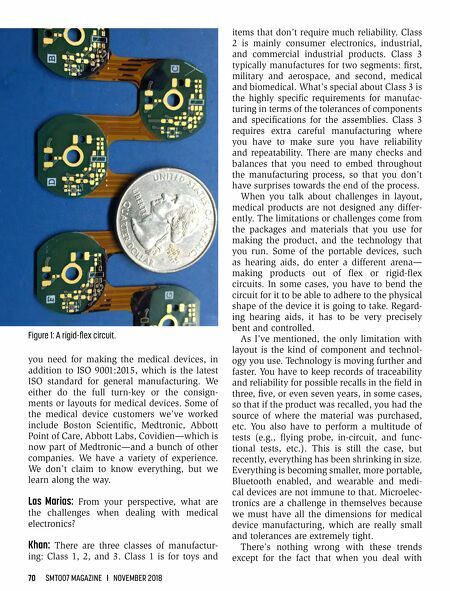 Las Marias: From your perspective, what are the challenges when dealing with medical electronics? Khan: There are three classes of manufactur- ing: Class 1, 2, and 3. Class 1 is for toys and items that don't require much reliability. Class 2 is mainly consumer electronics, industrial, and commercial industrial products. Class 3 typically manufactures for two segments: first, military and aerospace, and second, medical and biomedical. What's special about Class 3 is the highly specific requirements for manufac - turing in terms of the tolerances of components and specifications for the assemblies. Class 3 requires extra careful manufacturing where you have to make sure you have reliability and repeatability. There are many checks and balances that you need to embed throughout the manufacturing process, so that you don't have surprises towards the end of the process. When you talk about challenges in layout, medical products are not designed any differ- ently. The limitations or challenges come from the packages and materials that you use for making the product, and the technology that you run. Some of the portable devices, such as hearing aids, do enter a different arena— making products out of flex or rigid-flex circuits. In some cases, you have to bend the circuit for it to be able to adhere to the physical shape of the device it is going to take. Regard- ing hearing aids, it has to be very precisely bent and controlled. As I've mentioned, the only limitation with layout is the kind of component and technol- ogy you use. Technology is moving further and faster. You have to keep records of traceability and reliability for possible recalls in the field in three, five, or even seven years, in some cases, so that if the product was recalled, you had the source of where the material was purchased, etc. You also have to perform a multitude of tests (e.g., flying probe, in-circuit, and func- tional tests, etc.). This is still the case, but recently, everything has been shrinking in size. Everything is becoming smaller, more portable, Bluetooth enabled, and wearable and medi- cal devices are not immune to that. Microelec- tronics are a challenge in themselves because we must have all the dimensions for medical device manufacturing, which are really small and tolerances are extremely tight. There's nothing wrong with these trends except for the fact that when you deal with Figure 1: A rigid-flex circuit.